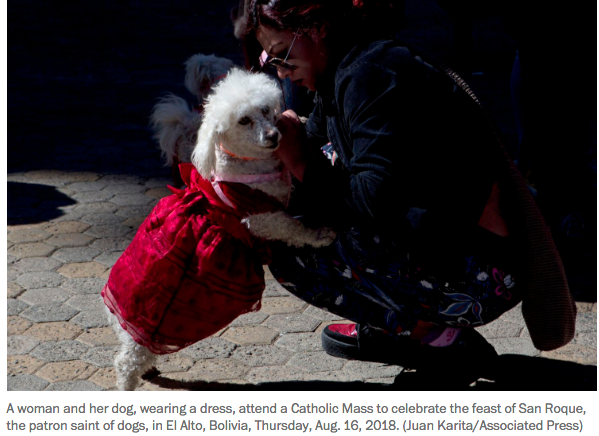 EL ALTO, Bolivia — Many Bolivians brought their dogs, often freshly groomed and dressed in costumes, to the parish of Villa Adela near the capital Thursday for a Mass honoring the patron saint of dogs. Every Aug. 16, the church holds the feast of San Roque, or Saint Roch, who legend has it was a 14th century French noble who traveled to Italy to care for plague victims and became the patron of dogs. He appears in images accompanied by a dog. In the city of El Alto, which neighbors La Paz, people walked their dogs to the parish church while other sent greetings and messages to dogs on social media. While owners brought their groomed pooches for the Mass, nearby street dogs fought over scraps in garbage dumps. There is no census of dogs in Bolivia, but the Ministry of Health estimates there is an overpopulation of 3 million dogs, with about a half million living on the streets.